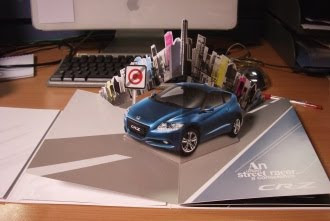 The sleek, embossed press pack for Honda’s CR-Z pocket-sized sports hybrid has been as lovingly designed as the car, although we were a bit surprised to find it presented in the form of a pop-up book. Pop-up is, after all, a literary format usually reserved for innocent, wide-eyed children, rather than cynical, bleary-eyed hacks. Following hot on the heels of Smart’s pull-the-tag activity book, we can’t help but wonder if the automotive world is regressing, slowly reverting to a happy childhood state, long before the credit crunch made the sky fall down. Later this week we will be visiting the Mini factory in Oxford. We’ll make sure to bring along a carton of brightly coloured wax crayons - on the assumption that we are bound to be presented with a colouring book.